The first reports are coming in. 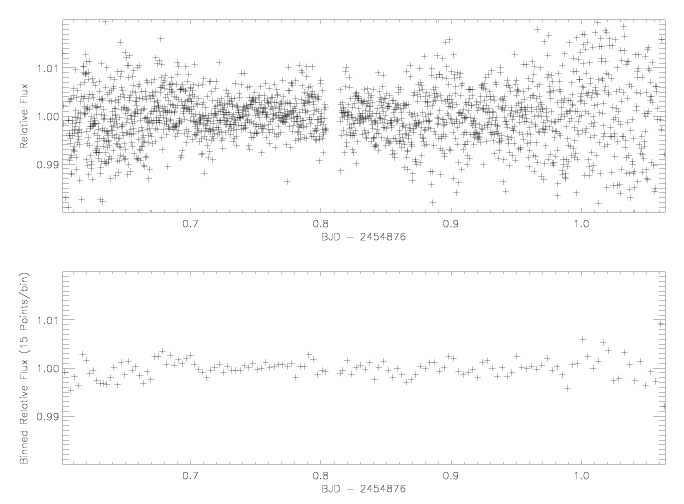 Gregor Srdoc in Croatia got a lightcurve through most of the night for HD 80606 combined with HD 80607. No sign of a transit, but the data is relatively noisy due to imperfect weather. Veli-Pekka Hentunen reports that weather conditions in Finland were bad generally, and were specifically bad in Varkaus. At least four sets of observations from various locations in Arizona are currently underway, including both the 40” and the 1.3m at USNO Flagstaff under the able command of Paul Shankland. Jonathan Irwin reports that data from Mearth through 5 UT shows no sign of an egress. We started observing at UT 02:30 in the V band. No sign of an egress at the ~0.005 mag level. That link will be updated with the entire night’s data in the morning. So it’s not looking particularly good for a transit, but I’m really happy that data is coming in. We’ll have a definitive answer sometime tomorrow. Thanks to everyone who observed. It’s really cool how a planet 190 light years away can bring observers all over the globe into a common mission. We’re now closing in on the moment of inferior conjunction, which hopefully will wind up being the midpoint of a central transit. The current weather in Europe looks like it’s clear for observers in Finland and Northern Italy, so it’s now quite likely that we’ll get a definitive answer from the campaign. Here’s our entire night of data (about 11 hours) from one telescope, using 80607 as the comparison star. Raw and binned x12 (about 5 minutes per bin). We are getting rms scatter of about 1.6 times Poisson with this fairly quick reduction. It’s now the middle of the night in the Far East, and the transit window has opened. The weather in Japan looks a little spotty, but Southern China is in the clear. Observers in Arizona reported good weather last night, but the forecast is a little iffy for tonight. There’s about a half-day left until the possible start of the ingress. On the map above, I’ve marked the locations of confirmed observers with small red dots. HD 80606b is 190 light years above the spot labeled with the orange circle. 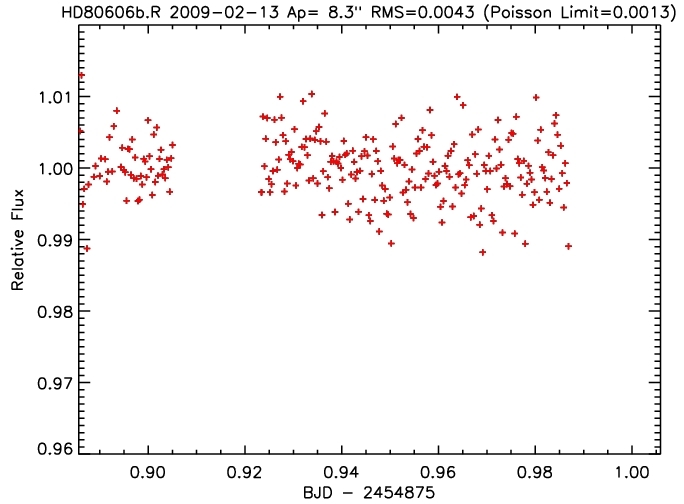 Observers in the US are currently taking data of both HD 80606 and its binary companion, HD 80607. It’s always good to have an out-of-transit baseline photometric time series. If the roof is closed, it is cloudy. I’ll be posting updates on the global HD 80606b transit campaign as I get them, with newer updates going to the top of this post. Everyone is encouraged to comment as the campaign progresses (click the number next to the post title to access the discussion page). I’ve lifted the restriction that only allows registered oklo users to comment, but all comments are now held for moderation, in order to keep the Viagra contingent off the air. http://www.astronomy.ohio-state.edu/~jdeast/demonex) just finished its baseline observations (UT 09:15 – 11:45 2009/02/13) in the V filter. We ended a couple hours early due to high humidity, and we had a half hour gap at UT 9:40 where I had to re-write my guiding software due to confusion with its companion. Preliminary reductions show no ingress at the >= 0.005 mag level (as expected). The last half of the night is rather ratty for reasons not understood at the moment. A better reduction will likely fix this. Even so, there’s no sign of an egress.